Nowadays, those who spend their days on a worksite are basically required to be accompanied by a vehicle that caters to all of their specific needs. Fortunately, these workers won’t have to look very hard to find their ideal vehicle. Chevy work trucks provide all of the features and capabilities that a potential owner could possibly need. All of the available engine options are capable of cranking out a whole lot power, while the accompanying technologies and amenities will make the work day a lot more bearable. Just because you’re seeking a new pickup for the worksite, it doesn’t mean that you have to pursue a truck that’s overly big. Instead, you can opt for a vehicle like the Silverado 1500, which is powerful enough to overcome any obstacle, but small enough to also serve as a daily commuter. Your line of work will surely require that your pickup is equipped with a powerful and capable engine. Well, you’ll undoubtedly be able to come across the proper fit in the Silverado 1500, as the vehicle offers drivers three impressive offerings. The 4.3-liter V6 engine can pump out a whole lot of power, as drivers can expect 285 horsepower and a best-in-class 305 pounds-feet of torque. Thanks to these incredible specs, drivers can expect their pickup to be able to haul up 7,600 pounds. Despite all of this muscle, there’s still adequate fuel efficiency from this truck, as drivers should anticipate a 24 mile per gallon highway fuel efficiency. Meanwhile, the 5.3-liter V8 engine found a way to increase that power, delivering 355 horsepower and 383 pounds-feet of torque. Predictably, these increased power specs also influence the towing capacity, as drivers should be able to haul up to 11,100 pounds. Similar to the smaller 4.3-liter engine, drivers can still expect a best-in-class fuel efficiency from the 5.3-liter option, as the unit delivers 23 miles per gallon on the highway. Finally, the hulking 6.2-liter V8 engine is for those seeking the utmost power, as the unit is capable of delivering 420 horsepower and 460 pounds-feet of torque, resulting in a best-in-class 12,500-pound towing capacity. A reduction in fuel economy is expected, although the 21 mile per gallon highway efficiency is still an impressive number. You’ll want to stay entertained when you’re on the worksite, and the Silverado 1500 provides a number of amenities that will improve your entire experience. The MyLink system allows drivers to choose between a variety of different applications, like radio and navigation. Meanwhile, the USB ports and 110V power outlet allows you to keep all of your gadgets fully charged, while the accompanying wireless charging dock means you won’t have to deal with any pesky cords. If you’re required to do any work from a remote location, owners can rely on the OnStar 4G LTE Wi-Fi, which provides them with a reliable wireless internet connection. Similar to Goldilocks, when it comes to your new pickup, you may not want something that’s too big or too small. In that case, the 2017 Chevy Silverado 2500HD is just right. The vehicle is the perfect choice for those who are looking for a hulking pickup that is the perfect combination of power, efficiency, and drivability. While the Silverado 1500 provides drivers with three different engine options, the 2500 HD only provides prospective customers with one single non-diesel offering. Fortunately, that offering delivers everything a driver could possibly want from a pickup engine. The Vortex 6.0-liter V8 engine provides excellent power specs at 360 horsepower and 280 pounds-feet of torque. Thanks to this power, drivers can easily expect a payload that exceeds 3,500 pounds and a towing capacity that approaches 14,800 pounds. Meanwhile, thanks to inclusions like Variable Valve Timing, drivers will surely be able to expect a fuel-efficiency that’s superior to the 17 miles per gallon that were delivered in the 2016 model. 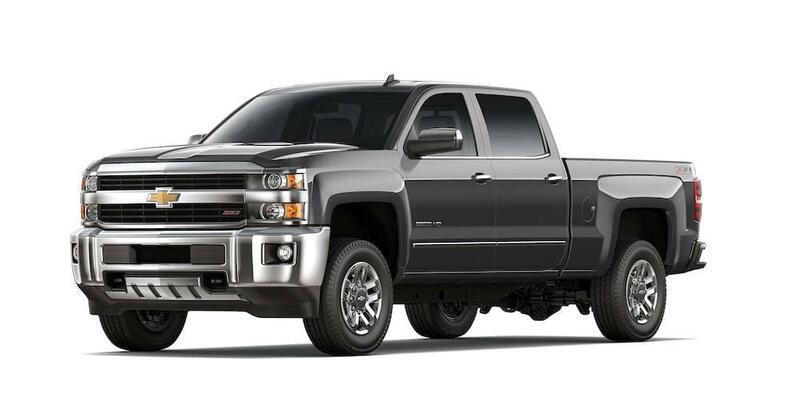 Alternatively, drivers can opt for the innovative Duramax Turbo-Diesel V8 engine (with the accompanying Allison transmission), which delivers an incredible 445 horsepower and a class-leading 910 pounds-feet of torque (resulting in an astonishing 18,100-pound towing capacity). This incredible power can be attributed to a number of different technological enhancements, like the brand’s one-of-a-kind induction system. Drivers won’t have to worry about their ability to control such a powerful vehicle. The Diesel Exhaust Brake System will provide optimal stoppage power, especially on hills, while the Trailer Sway Control will allow drivers to manipulate any of their hauled cargo. It’s probably not all that surprising, but the Chevy 2500HD provides an assortment of safety capabilities that should keep occupants safe at the worksite. For starters, equipment like the six available airbags will provide that necessary amount of cushion during a collision. Meanwhile, the OnStar Automatic Crash Response system will connect drivers with an OnStar Advisor whenever there’s an emergency. Meanwhile, the collection of preventive safety features should keep drivers out of harm’s way altogether. The StabiliTrak Electronic Stability Control System allows drivers to stay on their intended path, while the Forward Collision Alert, Lane Departure Warning, and Safety Alert Driver Seat should help operators avoid collisions. Now, if you’re looking for the ultimate pickup truck for the worksite, there’s no better choice than the 2017 Chevy Silverado 3500HD. After all, the vehicle delivers several class-leading power specs, and the accompanying mechanical features will make the truck incredibly easy to control. Therefore, you won’t have any issues maneuvering your new purchase when you’re busy on the worksite. We’re not attempting to sound like a broken record when it comes to the engines featured in the 2017 Silverado 3500HD. Rather, this pickup just offers the same exact units as the 2500HD. This includes that versatile Vortex 6.0-liter V8 engine, which also provides helpful technologies like Digital Steering Assist. Thanks to the uptick in the size of the truck, drivers can expect an increase payload of 7,153 pounds. Meanwhile, that class-leading Duramax V8 engine still provides everything a driver could possibly need from a pickup. While owners may anticipate that this powerful unit would emit noises that are often reserved for hulking vehicle, Chevy’s engineers intentionally designed the engine to cut down on these unnecessary annoyances. Inclusions like acoustic rocker covers, isolated injectors, and a full-length acoustic lower oil pan should help reduce cabin noise and vibration. If you’re relying on the Silverado 3500HD to help you on the worksite, then you’ll appreciate all of the opportunities that the truck’s exterior provides. For instance, the upper and lower tie-down hooks makes it extremely easy to secure any piece of equipment to the truck, with each hook being capable of holding up to 250 pounds. Meanwhile, the bed liner is thick, durable, and water-sealed, meaning you’ll have a tough time finding a piece of cargo that can compromise the bed’s aesthetics. The LED bed lighting makes it incredibly easy to access that cargo at night, while the Cornerstep rear bumper makes it possible for you to hop into the truck bed yourself.